Hint: It’s not about organic food. When people began to die from E. coli poisoning in Europe, the first thing we heard was that organic cucumbers were to blame, or if not, that organic tomatoes or lettuce were. There wasn’t a shred of evidence for this, but the Internet began to fill up with people swearing off organic food! Then the accusation shifted: it was German organic sprouts that were the culprit. Tests of the sprouts on the farm were negative. Well, so-called forensic evidence—in particular, the location of the infections—pointed toward the sprouts, so in the end they got the blame. It could indeed be the sprouts. They are grown in a wet, warm environment, which would be conducive to bacterial overgrowth. But let’s be clear: no organic fertilizer (manure) was used, so that was not the source of contamination. Since there was no manure, how could the sprouts have become infected? Did the workers not wash their hands? This isn’t likely to be it. Why? Because this was a new, mutant form of E. coli. Not only new and mutant—it was also resistant to antibiotics. A new, mutant, and resistant killer strain isn’t likely to come just from dirty hands. Then where from? Most likely the seeds. And where would seeds pick up a new, mutant, and antibiotic-resistant strain? It could be from farms where antibiotics are overused—not an organic farm. Readers may recall last year’s Preservation of Antibiotics for Medical Treatment Act, introduced by Rep. Louise Slaughter (D–NY), the only microbiologist in Congress, which was supported by organizations like the Union of Concerned Scientists and the Center for Food Safety. The bill, HR 965, has been reintroduced in the current session of Congress and now has 59 co-sponsors. It would ban the nontherapeutic use of antimicrobials in animals, and would ban the use of even therapeutic antimicrobials unless it can be demonstrated that there is “a reasonable certainty of no harm to human health” due to the development of antibiotic drug resistance. We have a new Action Alert on this new bill. The outbreak could also be related to the use of E. coli in creating new GMO strains: the E. coli bacterium is used by scientists to carry new genes into the organism. 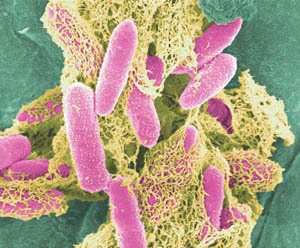 In the process, a new form of E. coli could have been created. If this happened (and of course, no one will ever know), it would be more than ironic to blame it on organic agriculture, which struggles to stay free from GMO contamination. There is neither evidence nor reason to believe that organic agriculture produces a greater threat of E. coli contamination than conventional agriculture. This is especially true because contamination is associated with huge, industrial farms, and those farms are not generally organic. If the first thing we heard about this outbreak was that it was an organic food problem, the second thing we heard was that it was time to start nuking our fresh produce. The FDA gave its blessing to irradiate raw spinach and lettuce three years ago, claiming that it was safe and had no effect on nutrients. This was in addition to prior approval by the FDA or USDA to nuke almonds, spices, imported produce and fruit, and especially meat—not surprisingly, much of the nuked meat ends up in children’s school lunch program. The Grocery Manufacturers Association wants more items approved for nuking, but also finds consumers reluctant to accept nuked products. The consumer reaction is, of course, just common sense. The human race didn’t make it this far by eating irradiated food. To assume such food is safe and nutritious is just folly, no matter how convenient it might be for a beleaguered bureaucrat looking for some quick fix. There is a fix, but it isn’t in nuking. It lies in a totally different direction. The massive Food Safety Act just passed by Congress requires the FDA to come up with new regulations to prevent E. coli and similar outbreaks. This is mostly a charade because no government agency has the slightest idea what to do about it other than nuke our food. As we at ANH-USA have noted before, the Food Safety Bill might have been written by the giant food industry, because it doesn’t do anything about industrial farming methods, the heart of the problem, and instead threatens the very existence of small farmers, including small organic farmers. Is there a way to make food safer? Yes. Make CAFOs clean up their act and stop destroying small, independent agriculture. And support Rep. Slaughter’s bill to ban the nontherapeutic use of antibiotics in animals! We’d also love to hear your comments about this article—just add your thoughts below—but remember that the messages below are only seen by our ANH-USA readers and not Congress.